Career and Volunteer services in offering a variety of Spring 2019 workshops during the next few weeks at different times and campuses to help you get job ready! Join us for an info-packed one-hour workshop that is open to all KPU students. 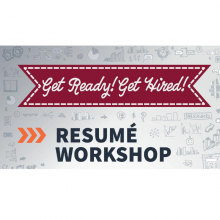 Resume Workshop- Langley: Create an effective resume or improve the one you already have. A well-written resume signals to employers that you are qualified, skilled, and professional. Learn what to include on your resume (and what not to) as well as how to tailor your resume for specific job applications, so you get results! Includes lots of examples focused on maximizing your experience as a student to highlight what you can do! 3) Find and click "workshops and info sessions"